What's the future of IoT in MEA in 2018? The Middle East and Africa (MEA) Internet of Things (IoT) market is set to grow 15% year on year in 2018, according to a recent update to the Worldwide Semiannual Internet of Things Spending Guide from International Data Corporation (IDC). 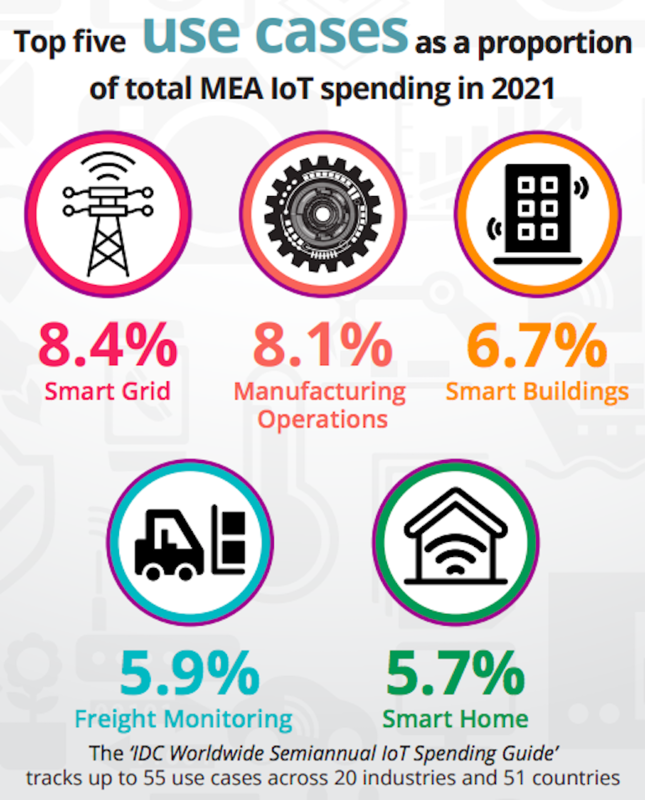 The latest forecast shows MEA spending IoT reaching $6.99 billion in 2018 and $12.62 billion – almost double – by 2021 as organizations ramp up their investments in the hardware, software, services, and connectivity that enable IoT solutions. IoT services are forecast to be the market’s largest technology category in 2018, with the majority of this total going towards ongoing services, IT services, and installation services. Hardware will be the second-largest technology category, followed by software and then connectivity. The vast majority of hardware spend (85%) will go towards modules and sensors. Meanwhile, software will be market’s fastest growing category over the coming years, with spending in this area increasing at a compound annual growth rate (CAGR) of 21.3% over the 2016–2021 forecast period. The industries that are expected to spend the most on IoT solutions in 2018 are manufacturing ($1.07 billion), transportation ($0.85 billion), cross industries ($0.76 billion), utilities ($0.75 billion), and consumer ($0.68 billion). Manufacturers will direct most of their IoT spending over the coming 12 months towards solutions that support manufacturing operations and production asset management. Over in the transportation sector, fleet management and freight monitoring will account for up to 78% of IoT spending in 2018. IN DEPTH: What’s going in with ad tech and martech? 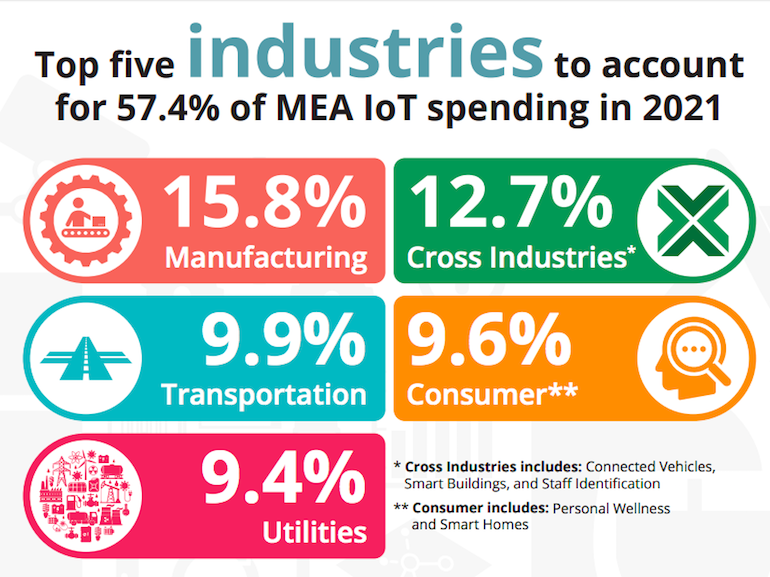 In the cross industries category, which represents use cases common to all industries, IoT spending will largely focus on smart buildings and connected vehicles. Smart grids for electricity will account for a little over 82% of total IoT spending in the utilities sector, while around 50% of consumer IoT spending will be driven by investments around smart buildings. The IoT use cases expected to attract the largest investments in 2018 are smart grid electricity ($0.62 billion), manufacturing operations ($0.57 billion), freight monitoring ($0.52 billion), smart home ($0.41 billion), and remote health monitoring ($0.40 billion). IDC forecasts manufacturing operations to overtake smart grid electricity into top spot by 2021. The use cases that will see the fastest spending growth over the 2016-2021 forecast period are insurance telematics (32.4% CAGR), smart buildings (31.4% CAGR), airport facility automation (30.5% CAGR), in-store contextualized marketing (28.8% CAGR), and electric vehicle charging (28.3% CAGR).